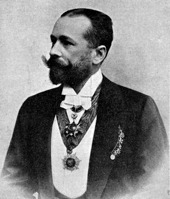 Josef (Pepi) Hellmesberger Jr. was the second generation of Hellmesbergers to hold significant musical positions in Vienna. For a period he was the conductor at the Carltheater. Later he conducted the Vienna Philharmonic following Mahler’s resignation due to ill health and remained for three seasons until he had to resign as a result of a scandal. He was taught by his father before studying at the Vienna Conservatory. Some of his polkas have appeared in recent years in the Vienna Philharmonic’s New Year’s Day Concerts, making him one of the few non-Strauss composers to be represented in these illustrious concerts. He wrote a wide variety of music, including more serious works. He had a wide musical talent, and his greatest success was his operetta Das Veilchenmädel (1904). The waltz from this operetta was recorded on the CD Spirit of Vienna Vol.1. His operetta melodies carry his own distinctive melodic inventiveness and Marco Polo dedicated a complete CD to his and his father's works. The father, Josef Hellmesberger Sr. (1828-1893), was also a composer and a very noted musician. who held the position of concertmaster at the Court Opera. His most remembered composition today is Ballszene.